Following the RACT2015 conference, held 25-27 FEB at Lund University, we invite submissions of papers for publication in a special issue of TOPOI (http://www.springer.com/philosophy/journal/11245). Papers must be in the order of 6000 to 8000 words (including references), and must address one or more of the conference themes (listed at http://ract2015.wordpress.com), whether from an empirical or a more conceptual perspective. Other than promoting rigor and quality of scholarship (as evidenced, for instance, by demonstrating, familiarity with the relevant literature), this special issue primarily seeks to inform readers who wish to reduce the distance between the research front and what is (falsely) presented to students as the state-of-the-art in critical thinking instruction. Therefore, papers should be of immediate relevance to those who teach or coordinate instruction in critical thinking as part of school or university education, either as dedicated courses or across the curriculum, or plan to do so. Of special relevance is the current trend to appropriate research on social, cognitive and other biases, as well as on two systems or two processes accounts of human reasoning. A screen shot of Rationale Online, click for a larger view. It’s no secret to regular readers here that I’m a big fan of argument mapping. I’ve written about it several times and it’s come to be a very important component of my teaching. That’s why I’m happy to have added Rationale Online, a web-based version of the Rationale software package, to the RAIL Resources page. 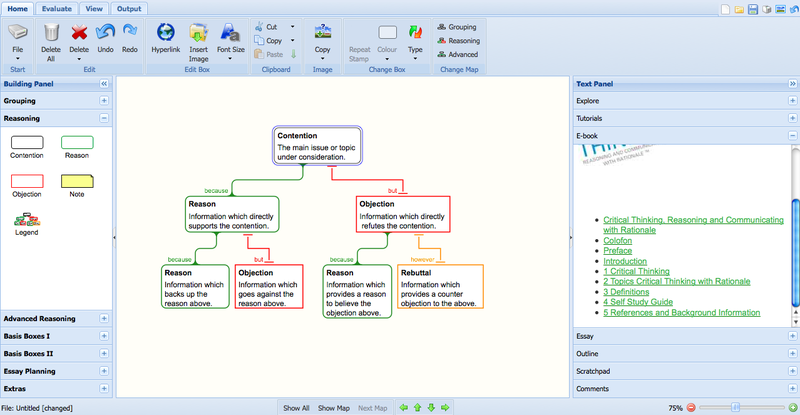 Beyond merely listing it there, though, I thought I’d put up a short post about it as I think it really does represent a positive step in the evolution of argument diagramming software for the classroom.